I have a 2 + year QH that I am having trouble getting him to use a bit. As I try to put in his mouth he will back up and refuses for to put the bit in his mouth. What can I do to get him to let me put on a bit, or is it his age? The best way to solve this problem is to forget about the bit and bridle for a few lessons. First you need to teach your horse to allow you to handle his head, his ears, his lips, his mouth, examine his teeth and so on. I use one of my old toothbrushes to get the horse used to having something in his mouth. This will also be safer for you than using your fingers if you aren’t really sure where the teeth are located (see drawing below). Hold the bristle end in your hand and rub the end of the smooth plastic handle along the horse’s lips. When your horse will allow you to do this without moving his head or backing away, then insert the smooth toothbrush handle into the interdental space – the area between the incisors and molars where the bit goes. If you don’t have a toothbrush handy, you can use an old, washed out dewormer tube for this lesson. Next be sure your horse doesn’t have any fear of you opening his lips to look at his teeth. Your veterinarian needs to do this anyway, so take the time to make sure your horse is comfortable with you handling all parts of his mouth and head. Then be sure you can handle and rub his ears and are able to bend his ears forward like you will need to do when you slip the crownpiece of the bridle over his ears. When you feel your horse is comfortable with all of this, be sure you are bridling properly. Refer to the photo above to show you how to put your right hand over your horse’s head and between his ears while you present the bit to the horse with your left hand. Be careful not to bump the horse’s front teeth with the bit. If he doesn’t readily open his mouth, you can insert the thumb of your left hand into the corner of his mouth – this usually gets the horse to open his mouth. See the illustration below to help you determine the safe zone for you to place your fingers – the interdental space which is the space where there are no teeth – between the canines and the wolf teeth. After you have thoroughly prepared your horse for the sensations of bridling, he should accept the process willingly. Take your time because these habits last a lifetime, whether good or bad. Best of luck, and let me know how you make out. What a wonderful web site and resource center. Your love for equine education is graciously depicted. I guess I am seeking reassurance about departing my daughters current lesson barn. The program was based on natural horsemanship and the structure and knowledge base and of the owner instructor/ owner had always overridden any weaknesses in the past. I am a mother of a 12 yr old. Her riding instructor (owner of the lesson horse) became extremely upset with me when I described erratic behavior in my daughter’s horse as “kicking at her.” The instructor/owner was not initially present to observe. The horse was tied at a rail for groom and tack. My daughter was on the right side of the horse. I looked up and saw horse’s head jerking back and forth and then back hooves off of the ground in my daughter’s direction. No one was hurt; but the horse’s behavior concerned me. My daughter described it as a buck. She has ridden for 2 1/2 years. My daughter also said she thought the stationary rope on the rail she was required to use was too short. Would I have been making an statement as a novice that would have been that inflammatory to the instructor? She kind of went off on me and kept asking me over and over again if it was a kick. I felt I was being bullied into changing my answer, but I saw what I saw and I stuck to my description only to really irritate her. Is there really that much of a difference when a child’s safety is an issue? Today there are so many wonderful horsemen out there providing lessons that there is no sense feeling like once you have chosen one you are married or are a disciple or bound by any strings, business, legal, personal or otherwise. I used those words not because of anything in your letter but because I have observed these things with other people in their relationships with trainers. And I am hoping my answer will help those people as well as you. I am so thrilled that there has been a surge of horse activities in many areas which makes the choice of instructors and trainers so much better for people wanting lessons or training. Of course with the surge came good trainers and not-so-good trainers, but generally the good trainers prevail. I hope it is that way in your area – that you have good choices – because once you feel the way your letter depicts, it sounds like a rift, a loss of respect and confidence and it could be time to say good bye and go shopping for a new lesson barn. Now specifically to your letter. YES ! A child’s safety is uppermost in any situation involving horses. 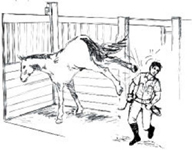 Semantics of whether a horse is bucking, kicking, cow kicking or grouching in some other way is immaterial. The fact that hooves toward child is unsafe no matter what you call it. And you as guardian of your daughter have every right to bring the matter to the attention of the instructor/owner of the horse. Horse people can get (unjustifiably) very defensive of their horses – we call this “barn blind” – “What? MY horse kicked? No way.” – That sort of thing. Perhaps that is what you experienced. Well, take comfort in that it is very common for people to think their horses, dogs, pets can do no wrong………but that doesn’t make their perception or reaction correct or right – and it would be especially ludicrous since the owner wasn’t present when the behavior occurred – that indeed is a blind sort of defensiveness. Of course, the best thing would have been to have an experienced unbiased eye witness, but since that didn’t happen, it becomes one person’s opinion against another’s. And since you are the novice, it is not hard to see a bit of bullying to get you to change your testimony. I can’t say what the horse was doing and why and if he was tied too short or any of that, but if you feel your child’s safety is at risk and you have lost faith in the owner or the establishment, then by all means, look for a new barn. But knowing what it is like to be a 12 year old girl who loves horses and has had several years of riding, I do hope you are able to find a new place soon ! Best of luck and thanks for your note. I hope something I said has put your mind at ease. Just when we were getting the horses used to some grazing, we got some crazy weather that dumped a lot of rain on us. Being that this is a semi-arid area with between 15-17 inches of moisture per year, we are ALWAYS glad of any rain or snow. However, because of the low annual moisture, our pastures are very fragile and it would take them a lot of time to recover from hoof damage during muddy weather or “whole plant grazing”. That’s often what happens when it is wet here – the horse takes a bite and instead of the grass breaking off, the horse pulls the whole plant out, roots and all. I think of how long it took that grass plant to establish and survive over the weeds yet in one casual nip, its gone. That’s a bad thing ! So to be the best stewards of the horse AND the land that we can be, when it is muddy, like it is today, the horses must stay in their large sheltered pens. They are often called “sacrifice pens” because the pasture that once was where the pens are now has been sacrificed – there is no vegetation. Keeping a horse in a large pen or run is often a necessity so here are some guidelines about pen life for horses. When you want your horse to have some room to move around but you don’t have access to a pasture, a good set up can be a group pen or individual run. These are usually located adjacent to a barn or other covered shelter and can vary in size from a bare minimum of 16’ x 60’ individual run off a stall to a 60’ x 100’ or larger pen off the end of a barn or loafing shed for a group of horses. A good pen has safe, durable fencing and comfortable, well-draining footing. The pen should be located on high ground and be situated such that the horses can take shelter from cold wind, wet weather, hot sun and insects as needed. There should be a clean place to feed and a comfortable place for horses to lie down. To prevent feed from blowing away, windscreens can be attached to the outside of the panels. The land in pens and runs is considered “sacrifice” because no vegetation is expected to survive the constant traffic. If the natural lay of the land doesn’t slope away from the barn or shed, then excavation should remedy this so that the shelter under the building is high and dry and the pen or run gradually slopes, about 2 degrees, away from the building. Depending on the native soil, footing can be added to provide cushion and minimize mud. Some choices are decomposed granite, road base, and pea gravel. A sheltered feeding area with rubber mats allows a horse to eat off ground level without ingesting sand or wasting feed. In the loafing area of the pen, bedding can be used to encourage a horse to lie down but it usually invites a horse to defecate and urinate there also. This behavior can be minimized or eliminated by locking a horse out of the loafing or eating areas except during specific times. Pen fencing can be made from metal panels or continuous fencing. Panels don’t require setting posts so are more adaptable to changing pen size or shape. Whatever pen fencing is used, it needs to be tall enough (5’ is OK, 6’ is better) and strong enough to withstand roughhousing, rubbing, and playing across the fence. Panel connections should be tight and safe. Pros and cons of pen life. See the book Horsekeeping on a Small Acreage.